Welcome to Lismullen National School located near Navan in Co. Meath. Here at Lismullen we have dedicated skilled staff to cater for the needs of your children. The dedicated teachers, special needs assistants, secretary & caretaker all take pride in the development, education and making your child’s experience at school a happy and fulfilling one. Our school of course also has 300+ wonderful children. The current school consists of 4 classrooms in the main building and 7 prefabs. A new school was granted by the Department of Education and Skills and is currently with the Site Design Team. We are delighted to announce the commencement of our new school in 2017 as part of the new schools’ building programme. The community had two local schools and the the years were taking their toll and the two schools; Dillons Bridge and Walterstown were subject to the elements and beyond investment. A site was needed which would be mid-way between the two schools in order to amalgamate pupils. Local farmer Richard Kieran was approached. 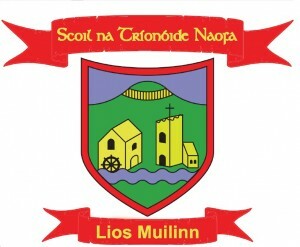 The site for Lismullen NS was sold to Father Keegan for the sum of £50. Boyle Building Contractors, Athlumney Navan were the chosen builders. The new school was officially opened in 1957. Mass was celebrated in the school by Fr. Keegan and the classrooms blessed. There were 111 children on the register, which included 63 from Dillon’s Bridge, 24 from Walterstown and 24 new pupils registered. Teaching staff were Mr Cullen, Mrs Mc Geough and Shiela Cunningham, filling in for Mrs Ferris who was on maternity leave at that time. Our school crest was designed by one of our children in 1996. It incorporates three features – a ‘Rath’ or ‘Lios’, a Mill and a Priory. We used these three motifs as all three had immediate connection with the locality of the school. The mill was situated on the river Gowra in Blundlestown, Lismullen on what today is known locally as the Mill Farm. It was still in operation until 1883 but there is no trace of it now. About 1½ miles up the road from the Mill is a very large hill fort which is now thickly forested. This fort or ‘lios’ is known as Rath Lugh. Lugh Lámh Fhada (Lugh of the Long Arm) lived here. It was he who instituted the Tailteann Games in honour of his mother Queen Tailte. These games predated the Olympic Games. The Fort and the Mill have given us the place name Lismullen – the fort of the mill – Lios an Mhuilinn – corrupted to Lismullen. About the year 1240 a religious house of Augustinian nuns, named in honour of the Holy Trinity, was established at Lismullen. In 1539 King Henry (viii) demanded that the nuns surrender all the possessions of the community. The prioress gathered her community together and surrendered. There is no visible trace of the convent but the name of our school derives from the priory – Scoil na Tríonóide Naofa.